Charcuterie is often served cold. It’s the simplest way to go. A board spread with cheeses and cured meats along with a bottle of wine. Instant party. However, charcuterie can be used in recipes. Think bacon. Yes, bacon is charcuterie. Smoked, cured and cooked meats all fall into the category. Sausages, too. So you already cook with charcuterie. Here are a few of our favorite charcuterie recipes. Get cooking and enjoy 15% off all charcuterie during Charc Week at dartagnan.com. Jambon de Bayonne can be wrapped around shrimp, as in our Basque brochettes. If there is anything better than cornbread, it’s our cast-iron cornbread with bacon. Garlic sausage wrapped in pastry dough makes for a super pig in a blanket. Salty seafood with spicy sausage – a classic combination enjoyed in our mussels with chorizo and white wine recipe. 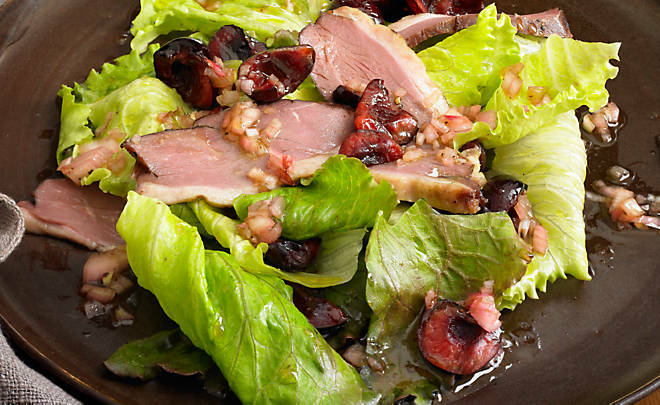 Just the addition of smoked duck breast makes a salad a meal, as in this smoked duck and cherry salad. And there are plenty more charcuterie recipes on our site. Enjoy the exploration.